Growing up, Dr. Mike knew he wanted to enter the health profession. A sports injury led him to seek the help of a chiropractor. “He fixed me right up. I was pretty impressed! We got to talking about chiropractic. He suggested I look into chiropractic and even said he would give me a job.” The natural healing profession aligned with Dr. Mike’s belief in eliminating the cause of the problem rather than covering up symptoms. He made the decision to attend Pasadena College of Chiropractic to obtain a Doctor of Chiropractic. While there, he learned many different techniques. He studied hard, mastering many, which later led to the eventual creation of his own method for adjusting, termed The Shows Technique. 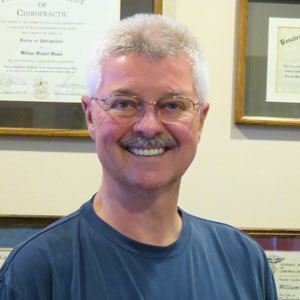 After his graduation, Dr. Mike passed his examinations and returned home, buying his former chiropractor’s practice. He enjoys seeing the successes of his patients every day, watching them get well and regain their lives. “Everyone is different, with singular problems that require unique solutions.” By taking the best of each chiropractic technique, Dr. Mike uses a combination that is most appropriate for each individual. He’s also board certified in radiology. Outside of the office, Dr. Mike’s family means everything to him, and he loves spending time with them. In his spare time, he also likes to work on cars. He is a former golf professional and enjoys getting out on the course when he can. We are pleased to offer a complimentary consultation and examination (a $250 value). Find out what we can do for you — contact us today!